After debuting its robotic doggo at CES 2018, Sony announced today that Aibo will officially launch in the US starting in September. 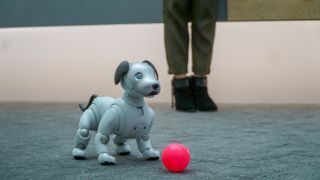 The news was presented by Sony US President and COO Mike Fasulo during an event held in New York City, where he also divulged Aibo’s official (and exorbitant) sticker price: $2,899 (around £2,269, AU$3,999). While that’s a heck of a lot more expensive than a pooch from the local pound, that price gets you an Aibo First Litter Edition robot, a charging station, three years of Sony’s AI Cloud service as well as a bevy of toys, including a pink ball, an “Aibone” and paw pads. The Aibo on show today is actually the sixth iteration of the cybernetic pooch and easily the most advanced that Sony has ever created, sporting cloud-connected artificial intelligence algorithms that endear Aibo to the members of the family that play with it the most, and a slew of sensors that help the robo-dog move around the house and interact with its toys. The obvious reason for Aibo's exorbitant price is the pricey hardware that go into each unit – sensors and actuators, not to mention the AI software. So how many sensors are we talking about? These sensors help Aibo interact with its environment, respond to your touch and react differently to when different members of your family approach it. While that hardware helps soften the sticker shock some, Sony's pooch might have a hard time being adopted by anyone who's not a devoted, cyber-dog-loving debutante. Sure, the cost of owning a regular dog isn't cheap either, especially when you factor in food, vet's bills, insurance... but then again, you're less likely to get a static shock of a real-life pooch too.